you are here: Fashion Tips | Nautical sets sail again! I have to be honest, i've tried to resist this trend. Every Spring the ''Nautical'' theme re-occurs in clothing stores; and usually it bores my to tears, however... this year, its looking modern and fresh. 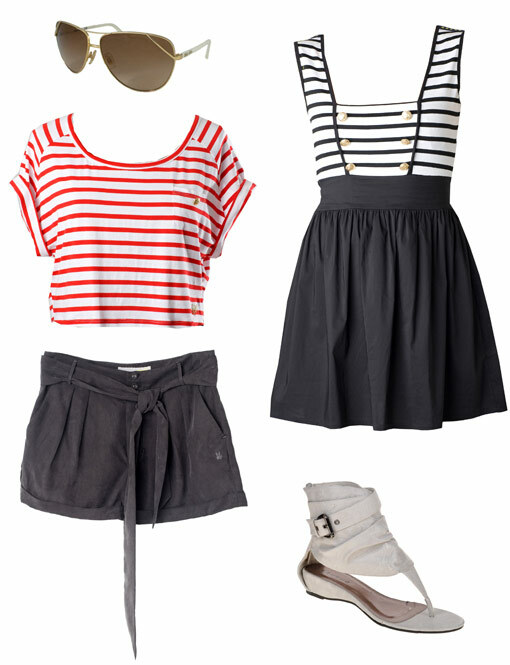 More ''jet setter'' than sailor girl; this could be the ideal weekend trend, comfortable and easy to wear. All you need to get the look is: a striped top (i love the loose T-shirt styles); paired with ''Boyfriend'' style denims, shorts or casual trousers in navy or white; accessorised with simple flats and a big shopper (white, tan or brown work best) - and you're out the door in style. For a little more detail to your outfit, you could add an anchor charmed piece of jewellery or a straw trilby hat.